Penshurst is a budget free standing holiday home which features 3 bedrooms - 2 bathrooms. Perfect for a family on holiday. The lounge area has that "Mexican Mountain Flair" with its vibrant colour scheme and furnishings. This reflects the owners artistic pursuits. There are board games and some DVD's for the kids. 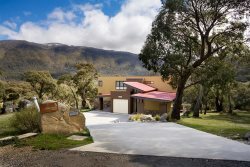 Heating is by gas heaters and electric heating throughout There are panoramic Lake Jindabyne and Mountains Views from the outside deck with a 'Webber Q' BBQ available. The large eat in kitchen has a refrigerator and dishwasher plus all the utensils you will need to cook on your holiday. Upstairs are two bedrooms with a bath/over bath shower in the family bathroom.The larger bedroom has a double bed and a set of bunks. This bedroom has great views from its private verandah. There is a smaller second bedroom upstairs with two single beds.Decor although dated is functional. Downstairs is the third bedroom with a double bed plus a single. There is also a bathroom with only shower on the ground floor. Even though a Budget property we supply high thread count linen and bath sheets for your stay. You will also enough toiletries such as shampoo, toilet paper, dishwasher tablets etc. for your entire stay [no starter packs]. Penhurst is located in Tyrolean Village, a quite neighbourhood which is a 5 minute drive from the center of Jindabyne. There is undercover parking for one car and off street for another and a boat if you wish to bring one. Undercover Parking for one car and off street for two others. Peter our host was great to communicate with. Great place for families & groups. The house is eclectic in style, clean & comfortable. It is about a 5 to 10 minute drive out of central Jindabyne, quiet & well looked after. Thank you for your help, we really appreciate. In case something happen, they react quick!! Thank you for letting us to stay. Peter is great host. He made sure the process of getting the key as smooth as possible. Highly recommended for your ski trip.